I have FINALLY finished this quilt. I started it probably 18 months ago? I went to the store with Miggles and she helped select the fabric (I already had some of it). She then designed it and told me what to do. It was a mroe random than pattern design, but the seeds ended up pretty much in a pattern, which was not planned. We went to her place to use her cutter. I got incredibly frustrated with it and she ended up cutting it for me. I started sewing when I could, which is not easy with 2 littlies. I got the bulk of the pink watermelon part done, then it sat in my cupboard. And sat, and sat and sat. A few days ago I pulled it out and finished it. The binding sucked and I am not a quilting fan. It was my first and most likely my last quilt. I am glad I did it. It’s finished and is one of my daughters many Christmas presents this year. I plan on doing some cushion covers to match it, but they will just be patch worked, no binding and probably no black seeds. There’s seedless watermelon too you know! Lol. 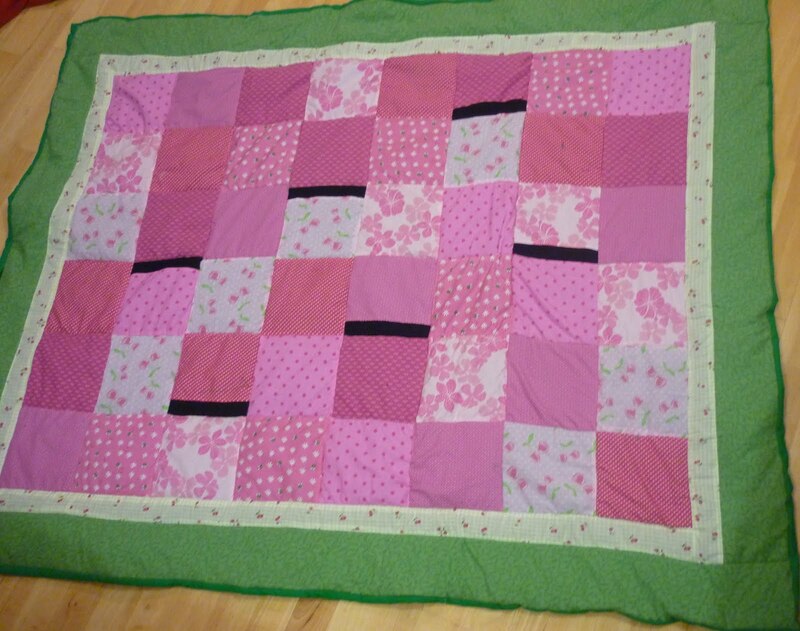 I used polar fleece as wadding because I already had it and I was so sick of quilting I wanted it finished NOW! My girls think it’s gorgeous. It's really cute! 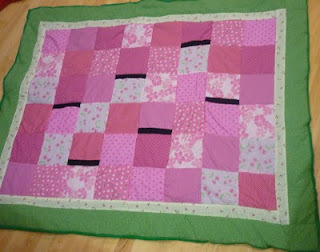 I love the colors and it looks well done, especially for a first quilt. I don't even do traditional binding on mine, I do cheater binding. I cut the backing large enough to wrap around to the front, fold it under with mitered corners, and whip stitch it in place. So much faster and easier than fussing with traditional binding, and looks just as good. It looks good! Glad you finally got it done, I've been wanting to see it for ages LOL The cushipons will look super cute with the quilt. That looks gorgeous! I love the colours and concept. My mum has just roped me into starting quilting. I have a table runner half done. I just wish I had more spare time to finish it. This is so cute! I wish I had the patience to quilt. I would love to make one for my daughter! Following back from Mrs. Mama Drama... and anytime you want to trade places for a week or two, just let me know. I'd love to visit Australia!